"Spectacular Grammar: Infrastructure as a Universal Language"
Spectacular Grammar: Infrastructure as a Universal Language is an exhibition and series of workshops which proposes that information technology infrastructure is more than just a tool for communication; it’s becoming foundational and inextricable from the structure of language. Building off Marshall McLuhan's "The Medium is the Message," in which he states “the ‘content’ of any medium is always another medium,” Spectacular Grammar puts forth the idea that information technology infrastructure is becoming the primary conduit for formulating language. Through hands-on workshops led by Mindy Seu, paige watkins, Color Coded, Feminist.AI and curator Renée Reizman, Spectacular Grammar presents diverse perspectives on how information technology infrastructure, through globalized distribution, international standardization, and research and development driven by a select few corporations, is forming a universal language. By examining archival canons (Seu), grassroots organizing (watkins), object-oriented agency (Color Coded), vocal politics (Feminist.AI) and mass production (Reizman), the workshops investigate the complexity of a budding information technology language. Language is not simply a web of embodied actions. Beyond sounds, gestures, and facial contortions, language is shaped by the technologies that we use to implement them. Technology isn’t solely futuristic mechaniations; it’s a stick in the dirt, a pen spewing ink, a metal plate pressed to a page, and a series of electrical currents and zeroes and ones making words appear on screen. Technology is rustic and advanced systems that make language–at least written language–represented in legible forms. Information technology’s tendrils spread underground, through seas, into the air, and even orbit around us in space. This infrastructure has become inextricable from the natural environment, and information technology only continues to increase its imposition into every landscape, item, and service humans interact with in the age of “smart” objects. Every day, people are subjected to things like facial recognition technology, surveillance networks, data collection, and GPS tracking. Consciously or not, information technology’s universality subtly informs the way people connect to one another. A message typed into a smartphone, a verbal exchange recorded by a virtual assistant, an emphatic gesture tracked through the eye of a camera–all of these interactions are mediated through information technology. But a universal language isn’t necessarily a positive development. Past attempts to form universal language–spanning from the biblical Tower of Babel, to 17th century linguistic philosophy, to early 20th century avant-garde filmmaking–have largely been failures. 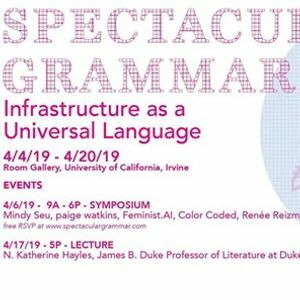 While the convenience of speaking the same infrastructure-infused language is enticing, universality risks stamping out individuality, enforcing dominant hegemonies, or rejecting actors who choose not to conform to universal standards. Spectacular Grammar’s exhibition and workshops leap from this historical context, weighing the successes and failures of universal language, to propel a speculative exploration of the different ways information technology infrastructure has become embedded into language, and how we may want to shape its future. Mindy Seu (she/her) is a designer and educator who is currently a student at Harvard's Graduate School of Design and fellow at the Berkman Klein Center for the Internet & Society. paige watkins (they/them) is a Black, genderqueer community organizer, archivist, educator and facilitator from Detroit. They just completed their Master of Community Development degree, sit on the board of the James and Grace Lee Boggs Center to Nurture Community Leadership, are a member of Black Youth Project 100 (BYP100), and co-founded Black Bottom Archives. Color Coded is POC-only transformative space that centers historically-excluded people in the co-teaching, co-creation, and co-ownership of new technologies. Our work supports and amplifies groups and individuals who are uplifting and sustaining communities of color—in Los Angeles and beyond. Together, we advance sustainable, community-centric projects to stay life long learners, protect our families, defend our hoods, decolonize and indigenize, liberate ourselves, grow collective wealth, and thrive! Feminist.AI is a community AI research and design group focused on critical making as a response to hegemonic AI. Rather than simply criticize the lack of diversity in AI design and development, we propose an alternative by co-designing intelligent products, experiences and futures from a feminist posthumanist approach. Renée Reizman (she/her) is an interdisciplinary curator, artist and writer at the crossroads of curation, social practice and critical spatial practice. She conducts long term research to examine cultural aesthetics and their relationship between urbanization, law, and technology. Renée embeds herself in communities to identify object-oriented networks that shape culture and society.